Do Keurig Coffee Maker Instructions Differ by Model? You can hardly find a household that doesn’t have a Keurig machine in the kitchen. And there are many reasons for that. But it all comes down to one: they make great coffee. 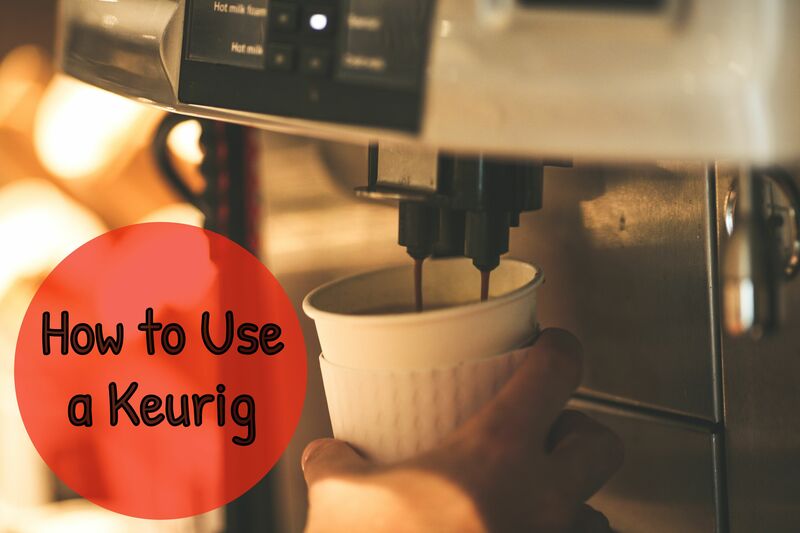 So, if you are a new happy user, it is time for you to learn how to use a Keurig coffee machine so that you could start enjoying your fresh, delicious beverages and the benefits they offer. Let’s dive right in! Take the machine out of the box and remove the adhesive tape from the parts of your Keurig. Place your machine near the power outlet. Keep in mind that you are very likely to use it often, so it’s better to find a good spot for your coffee maker. It needs to be easy to access and spacious enough to accommodate the machine. Plug the cord into the power outlet. Voila, you can now use your Keurig coffee maker! Consider this step a test run that will help you prepare the machine for use and clean it on the inside for your first cup of coffee. Fill the water reservoir (but make sure not to exceed the “Max” line). Place a mug or a container under the dispenser to catch the hot water. Wait for a couple of minutes for the machine to heat the water up. Once the brew size buttons light up, pick the largest size and press the corresponding button. Wait for the machine to stop dispensing hot water. Dump the water into the sink. You are now ready to brew your first cup of coffee! You need to remember to clean your Keurig machine regularly. All kinds of stuff can build up in and on it, including coffee residue, oils, tea sediment, and even scale deposits from water. One of the coolest things about Keurig machines is that they brew countless types of beverages, including different coffee kinds, tea, cocoa, hot chocolate, and so on. You can even find decaf coffee pods for those days when you need to reduce your caffeine consumption. Now, those plastic pods contain both ground coffee and a filter. Some models also implement built-in water filters for the purest flavor of your beverages. Pick the flavor you want to try first but do not remove the foil lid. To do that, you need to lift the handle. It will reveal a pod slot that holds the capsules. It looks like a round chamber. Insert the coffee pod of your choice in there and push the lid back down. It’s best to use your Keurig coffee machine with filtered or bottled water, as tap water tends to be quite hard and may leave mineral and chemical buildup inside of your coffee maker. Your Keurig machine has a drip tray, which is placed right under the coffee dispenser and serves as both a tray for your mug and a container that catches all the coffee drops. Place your mug on top of it. If your mug is too tall and doesn’t fit, you can either use a different one or try to remove the drip tray (some Keurig models allow for that). Typically, you have three options – 6, 8, and 10 oz – but some models brew 12 oz or even a full carafe. No matter how many options you have, picking one would not be a problem. You just need to press the corresponding button. Because this is your first time with Keurig, pick the smallest size first. This way, you will know what cups to use in the future. I mean, you don’t want to pick your favorite mug and then watch it overflow with coffee because you’ve chosen the largest brew size (and your mug turned out to be too small for it). As soon as you press the brew size button, your machine will take some time to pump the water. This usually takes a few seconds. Then, it will start dispensing hot, fresh coffee into your mug. Once you have your beverage, lift the machine’s lid, take the used coffee pod out, and throw it away. You can keep the pod compartment open for some time to let it dry. Or insert the next coffee pod and enjoy another beverage! What’s great about Keurig coffee machines is versatility. There are many different models suitable for almost any user. There are even Keurigs that make small espresso-like shots or feature built-in milk frothers for cappuccinos and lattes. Watch this short but helpful video guide to see how Keurigs work and what exactly you should do. Well, while operating in pretty much the same way, different Keurig models have their peculiarities. For instance, the 1.0 series machines brew only the K-cup pods, while the 2.0 series work with K-cup, K-mug, K-value, and K-carafe capsules. I know some of you find it boring, but reading the manual to your particular model is a good idea. One of the main reasons for that is compatibility issues. You see, the 1.0 series support all pods available on the market. At the same time, the 2.0 Keurig models (like this K575 machine, for example) can brew only the Keurig-licensed ones, which means you are somewhat limited in what you can choose to drink. Which Keurig model do you have? Do you find it easy to brew your coffee with it, or are you having any issues? Let us know in the comments!